This system allows you to connect TakkTile sensors to the internet using an ethernet interface and query the status of those sensors using a simple UDP protocol. In addition, there's also a ROS node that uses this functionality and publishes the information through a few topics. teensy 3.1 - Freescale MK20DX256 ARM Cortex-M4 dev board. enc28j60 - ethernet module using the Microchip enc28j60 ethernet controller. You can find these ethernet modules at your favorite electronics part distributor. The code can be adapted to other modules. Driver for the above ethernet module. There's quite a few changes I had to make for this library to work properly, so in the meanwhile, please checkout my teensy31 branch. alternative SPI library for the teensy 3.x (only needed for SPI initialization for now). ethernet firmware, ROS UDP node , Python UDP host driver, TakkTile Arduino class. This setup uses the regular i2c and spi pinout connections for the teensy. The connections to the ethernet module depend on what you have, but should be similar to what's below. The system requires 5V for the teensy and 3.3V for the ethernet module and i2c bus. The teensy 3.1 (but not 3.0!) IO ports are 5V tolerant, but have 3.3 logic levels. There's some exceptions to these, so please check the manual! Download and install the Arduino 1.0.5 IDE. 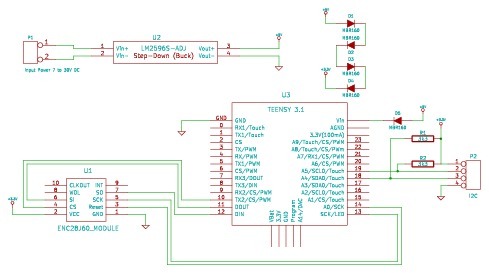 Download teensyduino and follow the instructions from that webpage. Don't forget to setup the udev rules. where PATH is the directory with the contents of the takktile_ethernet.tar.xz file. Open the arduino IDE, select the teensy 3.1 board and 24MHz as clock rate. Connect the teensy 3.1 board to your computer system. Open the TakktileArduinoUDP31 example, compile it and upload it to the board. The module can use DHCP or static IP addressing if you don't have a DHCP server running on your network. For reliability purposes, static IP addressing is recommended. In this case, you should set the static IP address of the module and use the IP address of the PC host system as gateway IP address. If running several of these ethernet modules, you should also set a different ethernet MAC address for each module. Check the definitions at the top of the TakktileArduinoUDP31.ino code. The module automatically detects connected sensors at startup or when it's reset / power cycled. An easy way of adding/removing sensors is to stop network querying the module (stop the ROS node) until the watchdog fires (see Notes below). When the MCU receives any packet on UDP port 31337, it will reply with the current sensor values in the above format. The UDP port can also be changed to a different value. where eth0 is the appropriate ethernet interface that shares the network with this module. If querying the module using the above python utility, you should see packets being sent from your host and right after a response packet from the module with the above UDP payload. 0x0000:  7469 692d 3033 3085 a994 a351 0800 4500  tii-030....Q..E.
0x0000:  3085 a994 a351 0018 39ea 79fc 0800 4500  0....Q..9.y...E.
0x0010:  00c8 0000 4000 3f11 709f c0a8 2465 c0a8  ....@.?.p...$e.. 0x0030:  0c0d 0e14 1516 2829 2a32 3334 3536 0080  ......()*23456..
0x0040:  c643 0000 ca43 0080 cb43 0080 e743 0000  .C...C...C...C..
0x0050:  fc43 0000 f943 0000 e943 0080 d243 0000  .C...C...C...C..
0x0070:  db43 0080 b743 0080 ec43 0080 ed43 0080  .C...C...C...C..
0x0080:  f443 0080 cd43 0000 dc43 0040 0244 0080  .C...C...C.@.D..
0x0090:  0344 0040 0344 0000 0344 0000 0544 00c0  .D.@.D...D...D.. 0x00a0:  0344 0080 0344 0000 0544 00c0 0344 0080  .D...D...D...D..
0x00c0:  0444 0000 0444 0080 0344 0040 0344 00c0  .D...D...D.@.D.. The teensy 3.1 main clock can run at 24MHz, 48MHz, 72MHz or 96MHz. You can select any of these, 24MHz works fine, the current sample rate limitation is the i2c clock rate. The i2c bus clock rate is set at 400kHz, but it can be set to higher speeds if the i2c cable is sufficiently short, if you can manage the load capacitance, use different pull-up resistors,etc. The network sample rate is limited by the i2c clock rate, as mentioned above. If you add more sensors, this rate will decrease. With about 30 sensors you can get 30Hz sample rate. There's a watchdog timer (WDT) running that will reset the system if there's no query from a remote host within 20 seconds. This value can be changed in the code to suit your setup. It can also be disabled, but it's not recommended to do so, since it protects against any problem with the sensors, ethernet module, internet connectivity , and any other issue that the MCU might run into. If the watchdog timer resets the MCU, you will see both the ethernet link green led and the teensy orange led go temporarily off and back on. The ethernet module negotiates a speed of 10Mbit/s. Some 1Gb switches take 20 to 30 seconds to auto-negotiate this speed, by which the system will not be able to respond to queries or pings, so take this into consideration when querying the sensor right after reset / power cycle. If this is the case you also need to increase the watchdog timeout to a value higher than the auto-negotiate time.